Have you ever opened a musty old book and spotted a minute brownish insect skittering across a page? Yep, this was a close encounter of a booklouse kind. Booklice are often found amongst forsaken books and magazines where they consume starchy materials like the glue used in bindings. But remember, books have only been around for a measly few millennia at best and the booklouse clan has been on the planet for some 250 million years. So what were those tiny starch eaters doing all that time? 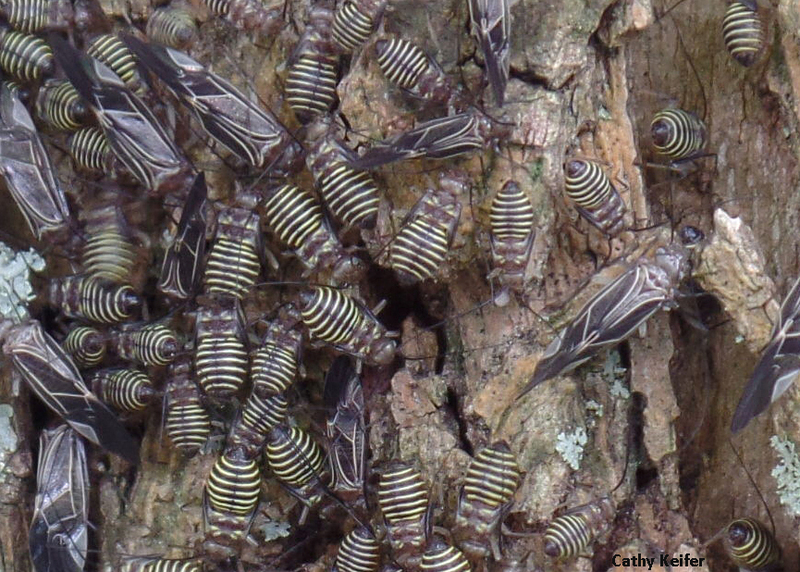 Over the past week or two several Bug of the Week enthusiasts sent images of psocids hanging out on the bark of trees. The wild cousins of booklice are known as barklice. They are commonly found on the bark and foliage of trees and shrubs where they consume lichens (symbiotic partnerships of algae and fungi), algae, and other organic matter. This natural detritus sustained Psocids for millennia until people kindly began supplying starch-based foods such as book bindings, glue, and grains. Psocids do not harm or damage plants. Recently, I joined a group of arborists inspecting trees and shrubs for pest problems around San Francisco where cool morning fog punctuated by brilliant afternoon sunlight provides excellent conditions for the growth of lichens and algae. Several plants we scrutinized had leaves infested with tiny insects that at first glance appeared to be pesky aphids. Closer inspection revealed these to be small colonies of psocids. Observe the wing buds on the back of this barklouse nymph. Soon it will molt into a winged adult that may be easily disquieted by bristles of a paint brush. Beneath silken webs on the undersides of holly leaves, I often encounter jelly-bean shaped eggs of barklice. 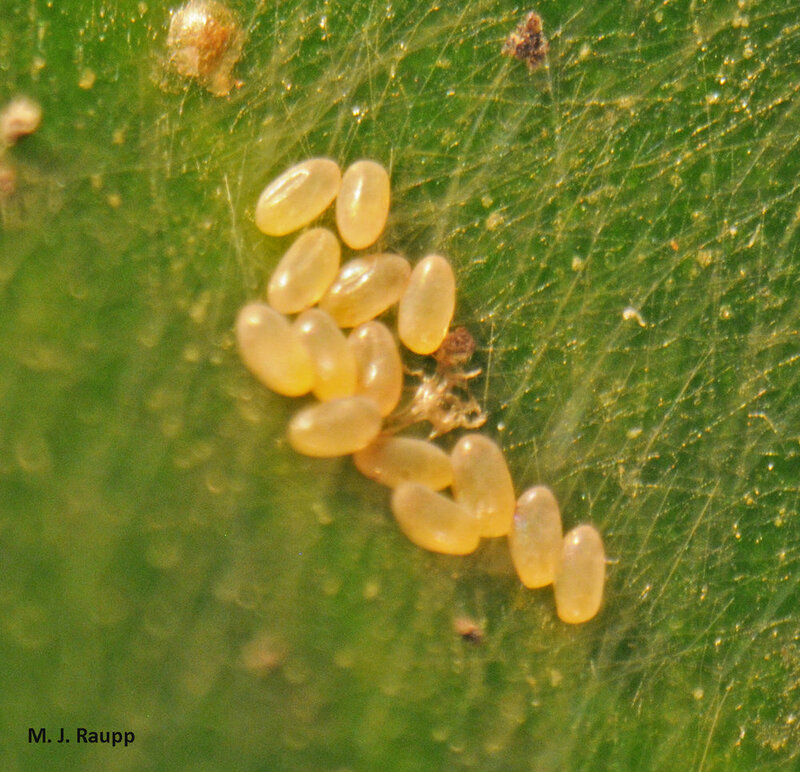 Psocids can be easily distinguished from aphids with the aid of a hand-lens. Psocids have large heads with chewing mouthparts and aphids have rather small heads bearing tubular sucking mouthparts. On the campus of the University of Maryland I often find adult and juvenile bark lice nestled beneath the broad evergreen leaves of native and non-native hollies. Barklice on hollies are sometimes associated with sap-sucking insects like soft scales. Honeydew from the scales forms the substrate for the growth of sooty mold, which may be a source of food for resident barklice. From specialized glands in their mouths barklice spin silk into delicate webs. Clusters of jelly-bean shaped barklice eggs often rest beneath these silken mats. Dense populations of barklice can create silken shrouds that encase entire branches and trunks of trees. 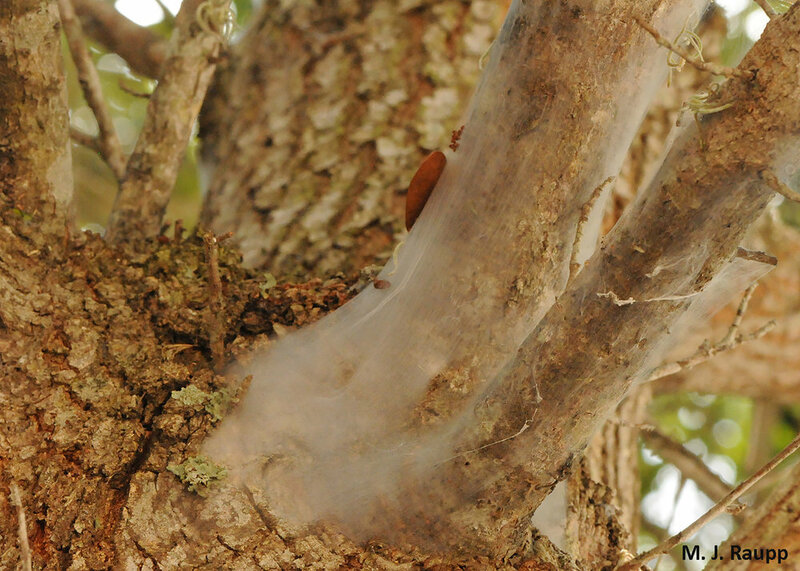 I witnessed a memorable barklice veil on a hawthorn tree at a rest stop along I-95. At a rest stop on an interstate, branches of a small tree were shrouded with barklice silk. While most barklice are harmless, some are important pests infesting grains and cereals. However, for the most part these tiny and sometimes colorful insects are simple members of Mother Nature’s recycling team. Bug of the Week thanks Rachel Rhodes and Cathy Keifer for providing images and inquiries that served as the inspiration for this episode. 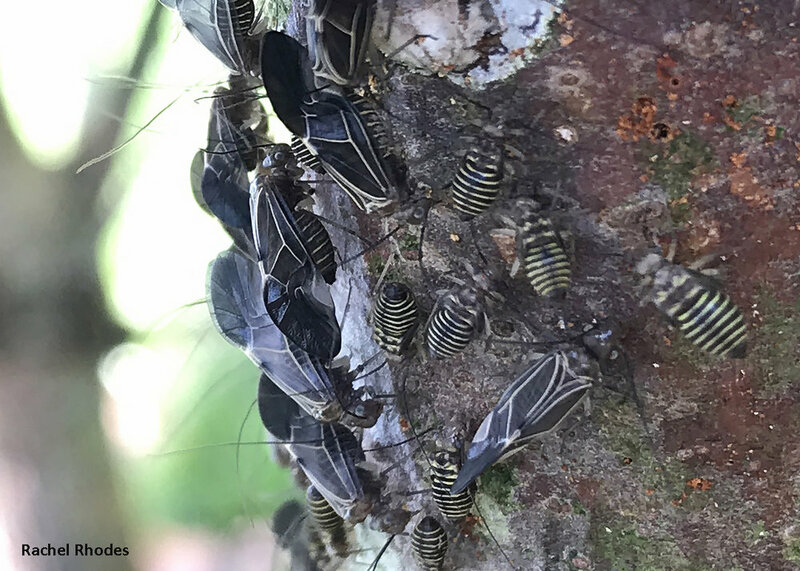 We thank Treemasters Tree Service for a peek at California psocids and the Maryland Biodiversity Project for aid in identifying psocids in this episode.